The ancient science of yoga taught us a technique of deep breathing "Yoga Breathing" or "Pranayama". Pranayama arouses the internal energy of a person and makes him healthy, balanced and active. 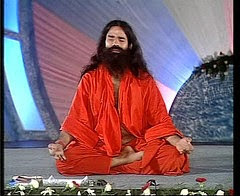 Baba Ramdev ji advises the seven-step pranayama package for a healthy, and stress free living. The whole process takes around 45 minutes and the duration can be increased up to two hours also. Morning time is ideal for its practice. Take bath and wear loose clothes. Sit straight; keep the neck and head absolutely straight. The body should be stable and spine should be straight. Procedure : Sit in a comfortable Asana. Breathe in through both the nostrils, till the lungs are full and diaphragm is stretched. Then breathe out gently. Take deep breaths and then completely breathe out. Duration : 2 minutes atleast. 5 mins max. Benefits : Heart, Lungs, Brain, Depression, Headache, Migraine, Paralysis, Neural System, Aabha Tej, Obesity, Constipation, Gastric, Acidity, Croesus (liver), hepatitis B, uterus, diabetes, stomach problems, cholesterol, allergic Problems, Asthma, Snoring, Concentration, and even Cancer and AIDS. Procedure : Kapalbhati Pranayama consists of short, powerful exhales and passive inhales. Push air forcefully out. Stomach will itself go in. Duration : Start with 30 times or 1 min. increase upto 5 mins min. upto 10 minutes max. Benefits : Increases aabha and tej. Helps in obesity, constipation, gastric, acidity, Croesus(liver), hepatitis B, uterus, diabetes, stomach problems, cholesterol, allergic problems, asthma, snoring, concentration, and even cancer and AIDS. Tips : Heart and High Blood pressure patients , and weak people should do it slowly. Procedure : Breathe air out, touch chin to chest, squeeze stomach completely and hold for a while. then release chin, breathe in slowly. Repeat the process. Duration : Beginners should perform Bahya Pranayama 3 to 5 times. Advanced practitioners can do 11 repetitions.However, in the winter, advance practitioners can do up to 21 repetitions. Benefits : Good for hernia, stomach ailments, uterus prolapse and all urinary and prostate problems. Channels the energy of the root lock hernia . Tips :People with hypertension and heart problem should avoid performing Bahya Pranayama. Procedure : Hold your right nasal with thumb, breathe in from left. Now open right nasal and close left nasal with middle and ring finger and breathe out from right nasal. Now breathe in from right nasal. Now close right nasal and open left and breathe out and in from left nasal. and so on. Duration : Atleast 10 minutes. Benefits : Heart, high BP, heart blockage, vat-cuf-pit, arthritis, cartilage, bent ligaments, sinual fluid reduced, parkinson, paralysis, neural related, depression, migraine pain, asthma, sinus, allergy. Tips :Breathe into lungs not to stomach. no organ in stomach absorb oxygen. Do not hurry. Do it slowly. Procedure : Close ears with thumb, index finger on forehead, and rest three on base of nose touching eyes. Breathe in. And now breathe out through nose while humming like a bee. Benefits : Concentrating on the center of the eyebrows (ajna chakra) visualize light in the center. Good for sinus problem, hypertension, heart blockage, etc. Vibrations created by humming destroys negative energy, reduces stress/tension, depression, fears and doubts. Feel that your body, mind and soul are radiating with light. Benefits : Good for insomnia and for deepening the quality of sleep and relieving bad dreams. Helps the mind to become one-pointed and facilitate the practice of conscious sleep (Yoga Nidra). Procedure : Close your eyes and sit quitely. Breathe in naturally. Duration : 2-3 mins or more. For Complete Pranayama Step by Step Sequence with Asana, Suksham Vyayayam And Mudras ... click here . Very useful link to get started on basic breathing / pranayam! Thank you for posing it.